This foot below is one of four. It is one of four feet that I love dearly. These feet rake down my leg for pets, and they scratch at the door to go out. 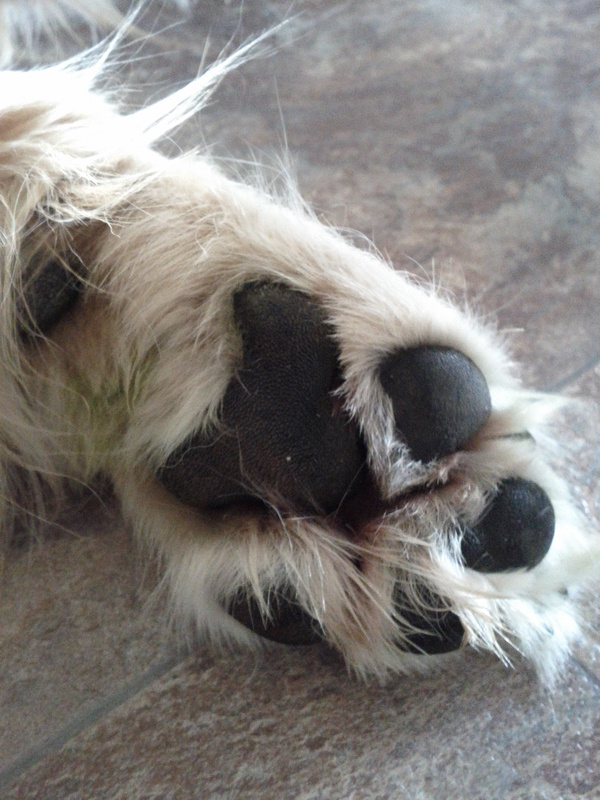 These feet kick bones and toys all over the house, and they dig up grass in the yard. They balance on my lap to enable nose rubs. They disappear when you touch them. They are soft, golden, tufty, and lovely. They slid across the floor awkwardly when they were brand new. They stretch out and curve to reach for me when I am sitting just out of the way. They rest on my knee when my attention is wanted and they tick along the floor when they move. One of Mylo’s four feet. These are also feet that I love. These feet hold my hand. These feet punch me when we play and they cover rolling tennis balls. They swat at bees and dig at curious objects in the grass. They sit on my shoulder when I wake up in the morning, and on my stomach when I go to sleep. They drag along the couch to ask permission to come up. They leave the ground to check if I’m real every time I come home. These feet pace back and forth in thunder storms, and twitch from dreams. 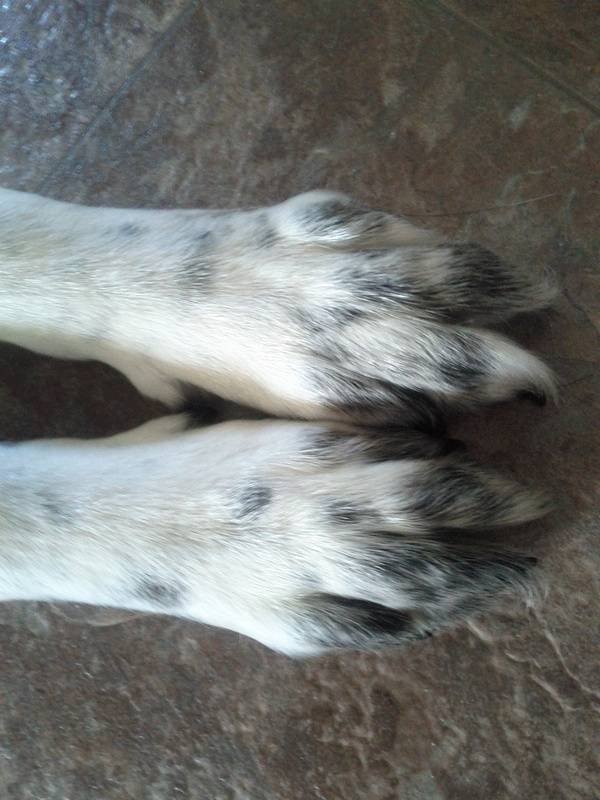 These feet are spotty and giant and love to be touched. Two of Toady’s four feet. All of these feet dance, beg, play, and tear around the yard. Of all the things that I love about my pets’ feet, my favorite is that they always bring my pet to me when I call. They obey at a walk, trot, or full-on sprint to find me when I need them. They bring them back to me every time they leave. If ever there is a day when these beautiful feet can no longer bring my boys to me, I will gladly go to them. These feet are the most wonderful feet in the world and I’m glad to have all eight of them in my life. What a wonderful and touching post. I enjoyed it a great deal. Thank you kindly. 🙂 It was just one of those days where I was feeling extra lucky for having my dogs. I love this post… its so touching. I love this. It made my heart melt first thing in the morning! those are great feetz! i love photographing paws, too. They’re awesome aren’t they? So much better looking than people feet. Great post and really neat photos. I love to dog feet. My dogs and I hold hand to paw all the time. I love my dogs’ feet too. They do all the things you describe and they smell wonderful too… like freshly baked biscuits. Go on… give your dogs’ feet a sniff. You won’t regret it! I have, but mine just smell like grass from running around all day. Sometimes they sort of smell like nachos too, lol.